Whole foods provide us with a great variety of essential nutrients that are not available in processed foods. These whole foods can be turned into delicious meals that are also less costly. Each fruit, vegetable, grain, nut or seed has it’s own variety of phyto-nutrients that give us energy, help our bodies detoxify as well as protect us from sickness & diseases. Overall health can improve greatly by preparing meals starting with nutrient rich whole foods. Often when serving guests we think that we have to buy ingredients that are processed & more expensive, thinking we are giving them the very best. Yet preparing meals by starting with whole fruits, vegetables, grains or other seeds are much healthier and can even cost much less. Yesterday at our Christmas Day brunch I wanted to serve the best nutritionally. I didn’t want to spend hours preparing either. Below is the filling breakfast of delicious waffles, fruit, meat and juice we all enjoyed prepared in just 30 minutes! The night before I took 4 cups of frozen strawberries & 4 cups of frozen blueberries out of the freezer. While baking the waffles I sliced and fried ham in coconut oil, cut up a pineapple, thickened the berries a little & set the table. In no time at all we were ready to eat. I made a double batch of the following waffle recipe. Instead of wheat flour, I used a variety of other healthy seeds! The single recipe below serves 6 people so I doubled the recipe. Put the first 3 ingredients into a blender and blend for 3 minutes to grind. Add the remaining ingredients and blend until smooth. 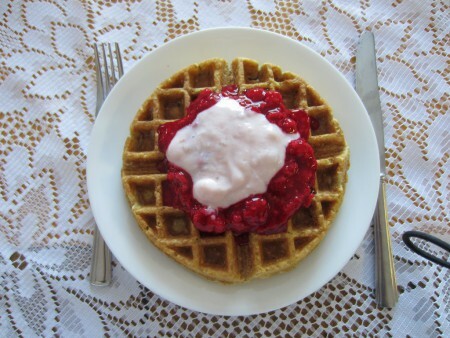 Measure out the amount needed by your waffle iron for each waffle and bake the waffles. Serve with syrup, fruits, yogurt or your choice of other toppings. Just by putting the waffles back in the iron for 30 seconds, they are reheated and delicious. We had 6 waffles left so I sent them home with our children. They can be heated up in a waffle iron, in the oven or microwave. This batter recipe can be used to make pancakes as well! Enjoy! In 1997 I created recipes and published EAT MORE WHOLE GRAINS cookbook. I wanted to share with everyone how easy it is to prepare foods at home; & saving money. I also added instructions on mixing by hand as well as using a BOSCH UNIVERSAL machine for developing gluten & mixing the dough successfully; saving lots of time. I met many people with allergies to different grains or seeds, so I included recipes in this cookbook that they could use and enjoy as well. When I reprint, this recipe will be added to the cookbook. This cookbook is always on demand & continues to sell at www.winnieswinningways.ca.